Philip Morris International Inc. (PM), the largest publicly traded tobacco company, will spend as much as 500 million euros ($680 million) on a new factory in Italy as part of a drive to make products with lower health risks. The plant, near Bologna, will start producing tobacco products that are heated with a special device rather than burned at the end of 2015 or early 2016, the New York-based company said in a statement today. The factory will have capacity to produce as many as 30 billion units a year, equivalent to about 6 percent of the European Union’s cigarette sales, the company said. “This first factory investment is a milestone in our road map toward making these products available to adult smokers,” Chief Executive Officer Andre Calantzopoulos said in the statement. In November, Philip Morris brought the launch date of the tobacco-heating product forward to 2015 from a previous forecast of 2016 or 2017. It will test it in a few cities in the second half of this year. 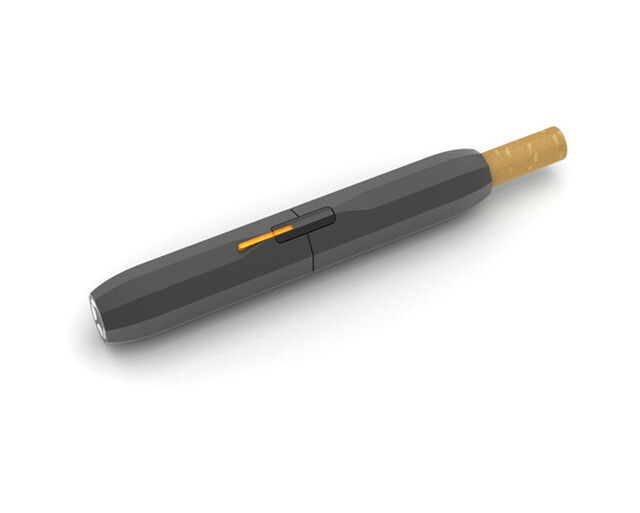 Unlike e-cigarettes, the company’s new product will contain tobacco to appease smokers’ cravings for the taste of a conventional cigarette. The device looks like a hollowed-out fountain pen. The custom-built cigarette is inserted and the tobacco is heated to generate a smoking aerosol. The temperature is “significantly below” what’s generated by a traditional cigarette, PMI has said. PMI has spent more than a decade trying to develop lower-risk products and started eight clinical trials on them last year, the company said. Philip Morris already has a filter factory and a pilot plant in Bologna. The new facility will employ about 600 people. The company will also enter the e-cigarette market in the second half of this year. What does it mean to “carve out” tobacco from a trade agreement? A “carve out” means an exclusion of tobacco products from the rules and benefits of the trade agreement. In effect, it gives complete protection for governments to regulate tobacco without fear of violating the trade agreement and being sued by the tobacco industry for doing so. Tobacco must be listed as an exception under all product references, removing its ability to benefit from free trade benefits between countries. This would not hurt any other products that benefit from the trade agreements because the exclusion would be product-specific. Trade agreements allow the tobacco industry to drag governments before foreign trade tribunals and demand that anti-tobacco regulations be removed or weakened. Oftentimes, these cases are not about winning but are instead meant to impose the huge costs of litigation on governments, which governments must pay even if successful in their defense. What is the irreconcilable conflict between the tobacco industry and public health? Unlike other products that can become harmful when abused or overused, there is no “safe” use or amount of tobacco. The tobacco industry simply seeks to increase consumption of tobacco, while ASH and its public health allies seek a higher level of global health. There is no “happy medium” to be found between the tobacco industry and the public health community. What is the Trans-Pacific Partnership Agreement, and why does it matter? The Trans-Pacific Partnership Agreement (TPPA) is a free trade treaty currently being negotiated between the U.S. and eleven countries bordering the Pacific Ocean. It will become the largest regional trading bloc in the world once completed, ideally in 2013. 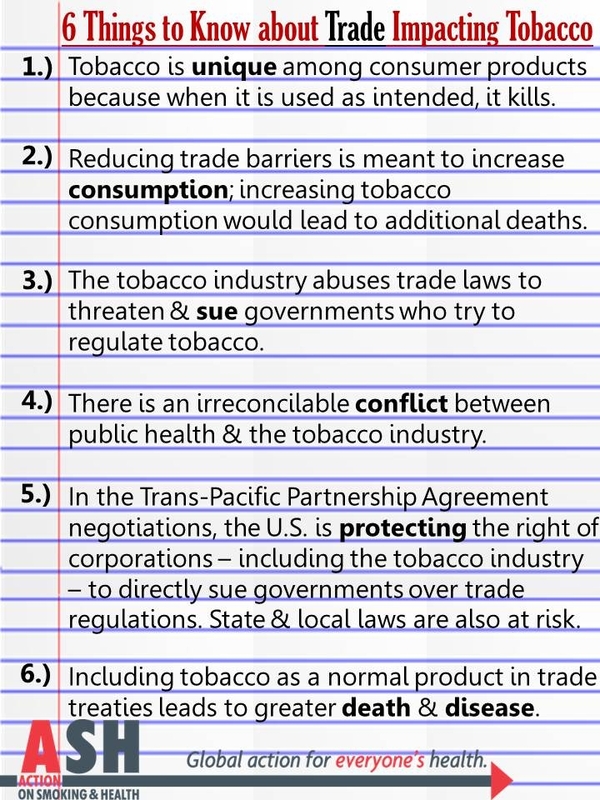 How many lives are at risk if tobacco continues to benefit from trade agreements? The WHO estimates that 1 billion people will die from tobacco this century unless drastic actions are taken. One of those critical actions to take is carving tobacco products out of trade agreements. It is impossible to predict how many lives hang in the balance of the trade debate, but it is certainly millions worldwide. NEW YORK — Philip Morris International, the largest tobacco company in the world recently announced yet another stream of revenue growth. With more regulation threats being imposed on tobacco companies and smokers, Philip Morris is looking to explore alternatives, according to a contributed column on Seeking Alpha. Governments globally have been attempting to regulate how and if cigarette companies can advertise. In addition, governments have hiked tax rates on cigarettes in an attempt to break people’s addictions by robbing their wallets. Philip Morris has responded by beginning to seek revenue through electronic cigarettes, chewing tobacco and snuff. Though Philip Morris’ smokeless effort is minimal right now compared to the tobacco industry, the company does have revenue coming from their joint venture with Swedish Match AB in 2009. The smokeless products from this joint venture are currently being marketed and sold in Russia and Canada. Revenues are expected to grow significantly too, as this is only the beginning of their marketing campaign, the column states. Philip Morris is also looking to follow in the footsteps of competitor British American Tobacco and begin marketing electronic cigarettes. Electronic cigarettes offer a somewhat healthier alternative to traditional cigarettes because when you smoke them, you inhale water vapor mixed with nicotine rather than harmful smoke. This is easier on your lungs, although the nicotine still has its normal effects. With consumers becoming more aware of the consequences of smoking, some have looked to electronic cigarettes as an alternative to help preserve their lung function. Long-term Philip Morris believes that electronic cigarettes will expand its revenue opportunities worldwide, the writer states. Philip Morris has the highest EPS growth rate among the tobacco sector for the next fiscal year; it’s estimated to be 11.2%, ahead of Lorillard, Altria Group and Reynolds American. Its revenue growth for next year is also expected to triumph in its sector by growing by a projected 5.51%. 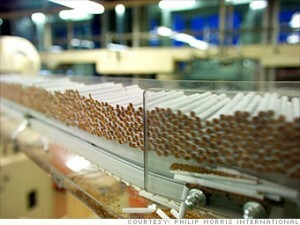 Philip Morris yields 3.3% at its current price. (Reuters) – A federal appeals court on Friday upheld a ruling banning tobacco company Philip Morris USA, a unit of Altria Group Inc, from making false or deceptive statements about cigarettes. The U.S. Court of Appeals for the District of Columbia upheld a 2009 injunction banning the company, which sells Marlboro and other cigarettes, from making misleading statements or implying health benefits. The court had previously upheld injunctions placed under the Racketeer Influenced and Corrupt Organizations Act, but the cigarette company brought a new challenge after Congress passed the Family Smoking Prevention and Tobacco Control Act in 2009. Philip Morris said the newest act, which increased restrictions on the actions of cigarette companies, made the injunctions redundant. But the company’s history of non-compliance led the three-judge panel to agree with a lower court that there is no assumption Philip Morris will comply with the new law. This is the thirteenth year of litigation between Philip Morris and U.S. government. The case is United States of America et al. v. Philip Morris USA Inc. Number 11-5146. It might be surprising to hear a tobacco giant described as a tech innovator. But Philip Morris researchers are pioneering new territory with a crowdsourced approach to checking the accuracy of life sciences data. In partnership with computational biologists at IBM’s Watson Research Center, Philip Morris’s so-called sbv IMPROVER project creates open challenges to encourage scientists to augment traditional peer reviews of research data. On Monday, Philip Morris launched its Species Translation Challenge, which will award three $20,000 prizes to teams whose results best define how well rodent tests can predict human outcomes. Similar competitions have emerged in the academic world, but sbv IMPROVER (short for “systems biology verification of industrial methodology for process verification in research” in case you were wondering) is the first that taps the crowd to verify industrial research. An initial challenge last year awarded $50,000 to two Wayne State University researchers who proved best at confirming genetic features that could be considered “diagnostic signatures” for particular diseases. Why is a cigarette manufacturer sponsoring such competitions? “Our number one objective is to do something about our dangerous products,” says Philip Morris scientific communications director, Hugh Browne. (The company is known for its periodic candor about such matters, even as it continues to dominate the industry.) From heart disease to cancer to emphysema, the potential consequences of smoking are well known. But not every smoker suffers all or any of those health effects, suggesting that a combination of environmental and genetic factors lead to disease. To understand precisely how smoking and chewing tobacco leads to complex interactions in a user’s biological systems, “Philip Morris is increasing its investments into systems biology,” Browne says. The company is looking at networks of genes, proteins, and biochemical reactions to identify the exact biological mechanisms perturbed by smoking. But such biological data is notoriously complex to analyze. The profession as yet lacks any standard methodology for verifying results, and traditional peer-review methods have “struggled with the volume and complexity of the data,” according to Philip Morris. 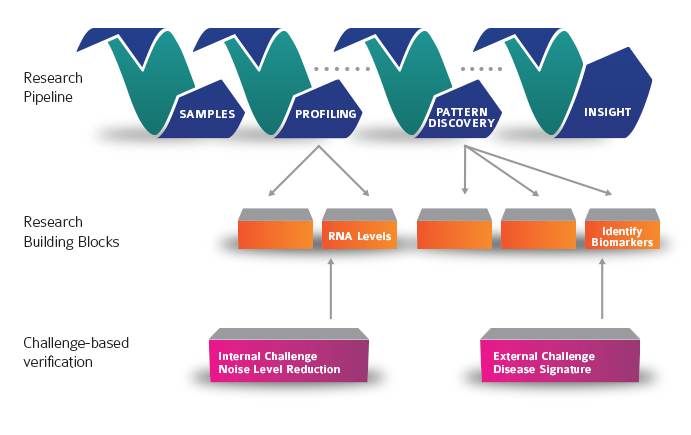 The 2012 IMPROVER challenge asked participants to identify signs in a patient’s set of transcribed genetic material that could be relied on to diagnose any of four diseases associated with smoking: psoriasis, multiple sclerosis, chronic obstructive pulmonary disease, and lung cancer. Competitors looked at clinical data from patients—some of it licensed from third parties and provided by Philip Morris; some from the public domain. More than 50 teams worldwide competed in the challenge that the Wayne State researchers won. Says Ajay Royyuru, director of IBM’s Computational Biology Center in Yorktown Heights, NY: “There was a refreshing variety of competitors.” The most successful applied fundamental understanding of biology “rather than brute force machine learning,” or automated big-data analysis methods. “Some came at it from a mathematical modeling approach, others came from biology, and others combined those,” he continues. (The Wayne State team comprised a bioinformaticist and a perinatal researcher.) Royyuru adds that the challenges can provide young scientists without scientific publications under their belt with a way to get recognition, and computational biology startup companies with a way to showcase what they can do. A team of IBM computational biology experts scored entries, and a five-man outside panel reviewed the scores. While no single team identified the data perfectly, the leading methods, considered in the aggregate, performed exceptionally well, Royyuru says. The new challenge launched this Monday seeks to determine if gene expression pathways identified in rodents will predict the same in humans. Scientists typically rely on them to study the impact of products on consumers, even though it remains unclear how well rodent results translate to humans. Four sub-challenges ask participants to determine 1) if the way signaling pathways in one species react to a given stimulus really predicts similar response in another species, 2) which biological pathway functions and gene expression profiles are most parallel in rodents and humans, 3) how much that depends on the nature of the stimulus or data type collected, and 4) which computational methods are most effective for inferring responses between species. Competitors will get access to about 5,000 human and rat samples Philip Morris generated for the challenge, and will look at 57 stressors to a single cell line exposed at different time points. Browne suggests that the IMPROVER approaches for verifying results could be useful as well in the pharmaceutical, biotechnology, nutrition, and environmental safety industries. And Royyuru sees the project as a step toward creating “a verification methodology that will become routine industry practice.” Who knows how Philip Morris might utilize the outcomes? For better or worse, they may seek to create safer tobacco products. I wonder if Philip Morris International (PMI) researchers have studied the ‘length of public memory.’ If so, the resulting answer seems to be ‘about 15 years.’ That’s how long it has been since the Tobacco Institute closed its doors, after 40 years of obfuscating the science on tobacco addiction, disease and death. A key aspect of industry strategy to forestall meaningful regulation has always been to question the causal link between tobacco and disease. PMI has just launched phase two of its sbv IMPROVER project (the title is short for “systems biology verification of industrial methodology for process verification in research”). The theme is “species translation challenge,” and PMI, in collaboration with technoogy giant IBM, will award three US$20,000 grants to scientists who can best poke holes in translating disease lab results in rodents to humans. In one online article very sympathetic to Philip Morris, the reporter states “not every smoker suffers all or any of those health effects, suggesting that a combination of environmental and genetic factors lead to disease.” This years project follows on the “diagnostic signature challenge,” in 2012 which gave a US$50,000 award for showing genetic markers for diseases linked to tobacco. The main purpose of IMPROVER seems clear – remuddy the waters on the causal link between tobacco and disease. But they actually get much more. By enticing young researchers to compete, PMI pushes back against the trend among major universities to not do business with big tobacco. These researchers are also a natural recruitment pool for the next generation of scientists who are untroubled by the ethics of working with big tobacco. By linking with IBM, working with universities, and comparing the effort to legitimate scientific endeavors such as DREAM, PMI gains legitimacy among the scientific community. Finally, IMPROVER is a rather brilliant example of corporate social responsibility marketing. Turning the purpose of the scheme on its head, PMI says its “number one objective is to do something about our dangerous products.” How can anyone argue with that? That’s not rhetorical – I invite responses on all the ways we can argue with that. On a side note, is the name IMPROVER a subtle nod and affront to MPOWER? Global trade negotiations in Washington this week will determine how cigarette companies will be able to market their products in developing nations—and potentially, overturn smoking restrictions around the world. As cigarette smoking has fallen in the United States and Europe thanks to public health laws and liability lawsuits, global tobacco companies have increasingly turned to developing markets to expand their business. Now they’re trying to make sure the largest trade agreement since the World Trade Organization gives them the tools they need to stop those countries from adopting the laws that cost them customers in wealthier nations. “It is very important for people to understand that the industry is using trade law as a new weapon, and [the Trans-Pacific Partnership] provides an opportunity to put a stop to that,” Susan Liss, the executive director of the Campaign for Tobacco Free Kids, says. Smoking rates are plunging in the US—from 25% of the population in 1990 to 19% today—and similar drops are happening in the United Kingdom, Australia and Canada. Today, of the world’s growing population of 1.3 billion smokers, 80% reside in low or middle-income economies. Tobacco companies naturally want to make sure they can protect and expand their businesses in those markets, especially among women, who have much lower smoking rates than women in wealthier countries. Until the late 1990s, the US government was keen to help American tobacco companies accomplish this end, threatening trade fights with Japan, Thailand, Taiwan and South Korea unless they opened their borders to US cigarettes and their sophisticated marketing campaigns. A government study found that in the year after US companies entered South Korean markets, smoking among teenagers surged, especially among young women, where the share of smokers increased from 1.6% to 8.7% in just one year. Should Tobacco Marketing be Illegal? This January marked the 50th anniversary of the first Surgeon’s General report on Smoking and Health. On that anniversary, a new Surgeon General’s report, The Health Consequences of Smoking—50 Years of Progress, was released. Read the report here> That report indicates that since the first report in 1964, more than 20 million premature deaths in the U.S. can be attributed to cigarette smoking. The report focuses on a myriad of tobacco issues, but one topic keeps recurring: marketing. Thousands of tobacco-related deaths can be tied to marketing by tobacco companies. In the 50 years since the first Surgeon General’s report came out, a lot has changed. However, tobacco companies are still marketing cigarettes and cigarettes are still killing over 440,000 Americans each year. 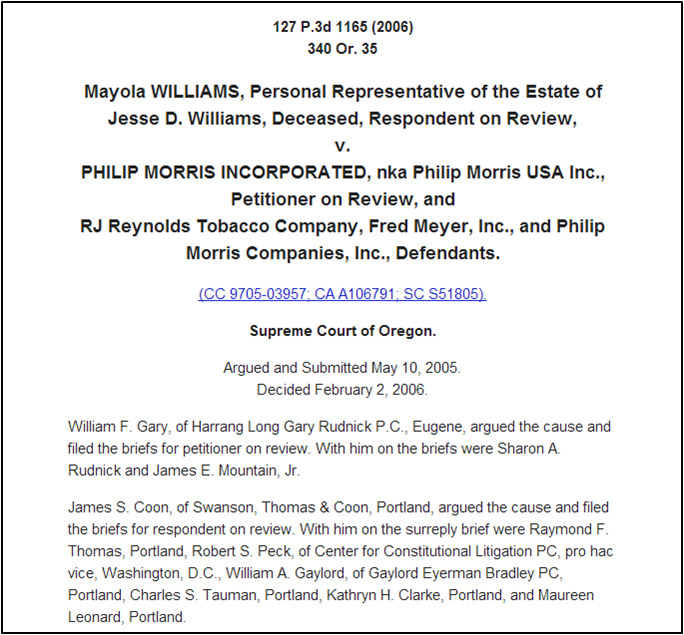 Additionally, the Oregon Supreme Court discussed the “the possibility of severe criminal sanctions, both for the individual who participated and for the corporation generally,” as a result of aggressive and deceptive promotion of dangerous tobacco products. Perhaps if Big Tobacco is subject to criminal liability for their marketing, we will have a smoke-free society by 2064 – the 100th anniversary of the Surgeon General’s report. Could criminal liability be the way to end Big Tobacco cigarette marketing? Bob Byrd is New Jersey’s “top lobbyist,” according to Content Delaware’s John Taylor, which recently interviewed Byrd for its conversational series. Byrd is the CEO of The Byrd Group, a lobbying firm that has worked for the banking industry and the education privatization movement, among other interests. TAYLOR: You don’t shy away from controversy. You represented the gaming industry, the tobacco industry, the, some of the alcoholic beverage industry. BYRD: If it’s a good idea, motherhood, or Apple Pie, I’m probably opposed! TAYLOR: (laughs) There’s social reformers and religious folks who probably think you’re evil for doing that. How do you respond to that? BYRD: When I first decided to do this years ago, one of the things I did is I realized that, you know, you’ve gotta go, if you’re going to do this, you have to go where the people are who are going to pay you. […] There’s a lot of other ways to say it, but that’s being real upfront about it. TAYLOR: How do you stay so active in Democratic politics and still get along, you know, successfully with Republicans in Dover? BYRD: You know, I’ve always said everything I am in this business and all of my success is a result of me getting elected to the legislature as a Democrat in 1974. Why is appearing at Big Tobacco-sponsored conference a greater offense in Australia and New Zealand than in the United States? Last week, Republic Report noted that six governors from both political parties attended a secretive trade talks conference in Washington, D.C. sponsored by a number of multi-national corporations, including Philip Morris International. These governors apparently were comfortable with allowing themselves to be wined and dined by some of the world’s most powerful corporate entities while pushing for a new NAFTA-style trade agreement for the Pacific region. While U.S. politicians have grown accustom to this sort of stealth corporate lobbying, it appears that some of our overseas neighbors have not. The Australian embassy actually withdrew the Australian ambassador from the conference after it became apparent that Philip Morris would be sponsoring it. Meanwhile, in New Zealand, several political parties have called for Mike Moore, the country’s ambassador to the United States, to be fired because he attended an event sponsored by the tobacco industry. Other political parties have called for full disclosure of the details of how Moore ended up at the conference, including a disclosure of whether or not he was authorized by the government. Meanwhile, the Public Health Association there roundly condemned Moore. Cabinet ministers in New Zealand’s federal government have pushed back against calls to censure or withdraw Moore, but it is interesting that his appearance at the conference has become a scandal at all. The reactions by the body politic in New Zealand and Australia to a conference sponsored by Big Tobacco as compared to the nonexistent response in the United States is instructive in how deeply corporate influence in our politics has become a normal affair.